Tatami Fightwear’s Mens Zero G Super Lightweight Competition BJJ GI. After months of design and testing Tatami Fightwear are proud to introduce their Zero G, one of the lightest bjj gi in the world. 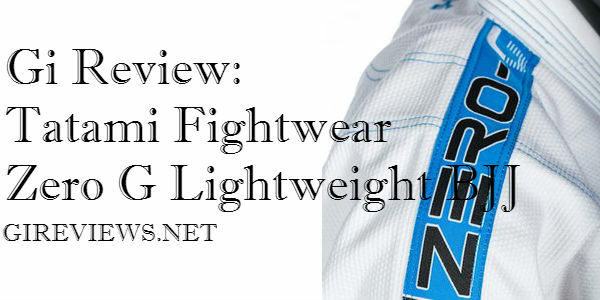 Tatami Fightwear’s Zero G BJJ GI (bjj gi) has been designed in conjunction with some of the worlds best BJJ athletes, and is constructed so that the design, durability, and fit across all sizes is the best it can be. The Zero G with jacket and pants weights 1.5kilo (A2 Mens) making it one of the lightest BJJ GI’s on the market and as always comes with a free Tatami Fightwear Zero G branded GI bag. The gi is VERY lightweight. The entire gi weighs just a hair over 3 lbs. This gi is manufactured in Pakistan for the Tatami Fightwear company. When I pulled it out of the package, the first thing that jumped out at me was the flair. The patches are a bright blue, and stand out from the crowd. The second thing I noticed was how light the pants are. They’re very soft and light, like pajama pants (no kidding). The first time I wore the gi, it got a lot of attention. In a group of guys wearing Bad Boys, Atamas, Gameness, Venum and the rest of the current group of lighter weight gis, the blue patches and other graphics really made the Tatami Zero G stand out, without, IMO, being too loud. The gi is sharp and light. If you’re looking for a quality, competition gi, this one will definitely fit the bill. This is particularly true if you’re competing at tournaments that require you to weigh in while wearing your gi, such as at IBJJF tournaments. The look and feel is terrific. This is a good looking gi that’s tailored well. It’s going to get some attention, without being as overt as other gis that are all flaired out. At this point, this is really a question mark for me. The jacket is well made and looks to be on par with many much more expensive kimonos. The pants are really what I don’t know about and why I gave the Zero G a 3 in this category. Ultimately, it’s about weight and cut and being IBJJF legal, and this gi does those things. If you’re looking at something that’s going to hold up to day to day training, I might look at one of the other models offered by Tatami or elsewhere. Again, if you’re looking for a competition gi that’s super light, looks good and is legal at IBJJF competitions, this is a great deal. If you live in the States, it’s going to cost you a little more for shipping, which is the only reason I couldn’t give this gi a 5 in this category. But 4 is very, very good, and at approximately $110 including delivery, this gi is a very good deal. Head over to Amazon and shop for IBJJF-approved gis now! The Zero G is one of several (relatively) inexpensive BJJ gis from the UK, currently coming in at £57 (in the US, you can buy them here). I saw a lot of other people wearing the Zero G at Gracie Barra Birmingham, whereas I’d previously been a lot more familiar with Black Eagle, apparently the beginner gi of choice at the Roger Gracie Academy (at least when I was there). The Zero G is light, comfortable and not too expensive. I’ve been rolling in it for a few months now, and I’ve been happy with the gi so far. The material doesn’t feel too stiff, and it isn’t overly abrasive on the inside. You also get a blue drawstring bag included in the price, which is a nice touch: naturally that has ‘Zero G’ in big letters down the side. There are three main drawbacks: first, the cut is rather square, and despite some shrinking, I still find that the A2 jacket is a bit baggy, with the sleeves also a bit long for my liking (I’m 5’7 and 65kg). Secondly, I’m not too sure about the rope drawstring, which feels looser and less secure than the flattened cotton strip I’m used to. However, having paid close attention to it during sparring, it didn’t come loose, and unlike the flattened strip, I wasn’t retying it several times during the lesson. It also seems to be less prone to the problem I have with all my other gi trousers, where one side of the strip (normally the right) gradually ends up much longer than the other, requiring some tiresome pulling and pushing to try and equalise the two lengths. The third problem is that the Zero G is doused in patches, making me feel like a walking billboard. It isn’t much of a problem though, as to remove the patches is a simple matter. You can either use a seam-ripper (I think that’s what they’re called), or like me you can just use nail-scissors. Digging underneath a part of the patch, cut a few strands, until you can pull up an edge. That then enables you to methodically chop your way through the rest of the threads, which are now clear to see: most likely you’ll be able to rip it free at points, but I’d assume that is more risky. I don’t like to spend a lot of money when I’m buying a gi, so £57 is about as much as I’m willing to fork out. For me (and I babble about this more in an article from a while back), it is a functional piece of equipment, not a fashion statement. Hence why I’m most likely going to be sticking with basic, cheap judogi (like the one from Black Eagle) and budget gis for the foreseeable future. Having said that, I am tempted by the super lightweight ripstop gis, as that would ideal for the US training trip I’ve been wanting to make for some time now. Something like the newGrab and Pull should pack up tight, weigh little and dry fast, none of which is true of my other gis. The Fushida Mantis might fit the bill too (there’s a review of their impressive customer services here), though that only has ripstop trousers, so I’m not sure how quick the jacket dries. Howard was wearing one at RGA Wycombe, so I’ll check with him. Excellent quality gi at an affordable price. The pants are absolutely the most comfortable gi pants I have tried so far. I love this gi, it is super light and comfortable, perfect fit and for the price the material is great. Order without fear. First thing that I noticed about the Zero G when I was rolling in it, is how nimble I felt in guard / underneath. Turning shoulders / hips and sliding along the mat felt easier vs the other gi’s that I have. It weighs about 3.5 pounds. You can’t go wrong getting this gi.